Unlock the riches of ancient Egypt on a video slot that reaches new heights in terms of online casino entertainment with Coins of Egypt slot game. Ancient Egypt is a popular theme in the slot game world and it could be seen as a challenge to add something new to the scene with yet another game with the same theme. Coins of Egypt slot has raised the bar to new heights with a beautifully designed video slot game, that has great graphics and entertaining features. Due to its low volatility, chances are high you frequently hit small wins, while higher-risk players have the possibility to claim big rewards. Coins of Egypt slot game is set in somewhere in the vast Sahara Desert where you have come across an unknown tomb filled with treasures of a forgotten king of ancient times. There is a lot to experience on this video slot. Not only due to the stunning graphics and exciting features, but also because a lot of different symbols appear on the reels. You find all the mythical symbols related to ancient Egypt on and around the reels like the winged god, the scarab and the jackal. True to its name, the game also knows coins with images of a snake, an eagle and a golden cat. Another images that appears is the Chest seal with which you can unlock the coins you have collected in one of the three chests. Furthermore, a pharaoh’s mask can appear on reel 5. When it does it opens up and reveals a magical fire, which adds additional coins to your balance. An ancient Egyptian king needed strong protection, so we also find images of other ancient Egyptian gods on the reels you. In addition to all this, you find symbols of some other creatures on the reels like enchanted bugs and scorpions that might have been roaming in the tomb for thousands of years. The scene is mystical and is keen to give you a glimpse of another realm. 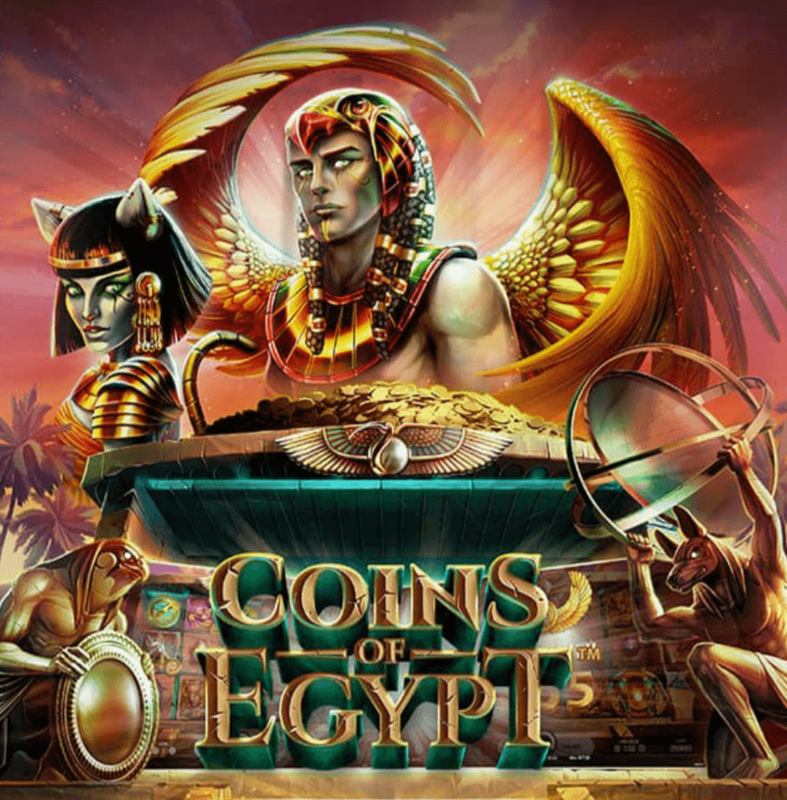 Coins of Egypt invites you to conjure up some magical wins with beautiful symbolism and special features like Free Spins and the Pharaoh Coin Win. In the main game you can play up to 3 coins on reels 1, 2 and 3 (one coin per reel) and their value can vary from 2 up to 15 times your wager. When you play the image of the Pharaoh on reel 5, all coins you have played in the same round will be collected and added to your balance irrespective of bet lines. The image of the scarab functions as the Wild symbol. You win 3,000 coins if you manage to play 5 of these symbols in one round. If you fill the entire reel with Wild symbols, you win 60,000 coins. As the Wild can replace any other symbol with exception of Scatter symbols and the Chest Seal symbol, it can help you complete a winning combination. The Golden Winged god functions as the Scatter symbol and it can trigger the Free Spins round. The Free Spins Bonus Game is triggered when you play a Scatter symbol on the first, third and fifth reels. In this mode you can play different coins on different reels. On reel 1 Ruby Eagle coins appear, which will be added to the Ruby Eagle Coin chest. Their value varies from 2 up to 4 times your bet. Emerald Snake coins appear on reel 2 and have the value of 2 to 5 times your bet. These coins are collected in their respective chest. On reel 3 you can play Golden Cat coins that will be collected in the Golden Cat coins chest and have a value of 4 to 10 times your bet. At the start of the Free Spins Bonus Game, the total value of all coins you have played in the same round that triggered Free Spins mode will be added to their respective chests. There are 3 chest seal symbols, that correspond to each chest and only appear on reel 5. You can collect 1 chest seal symbol for each chest. The Free Spins Bonus Game ends when you play three the same chest symbols on reel 5 in one round. You win the contents of the chest for which you have played the three identical chest seal symbols and their value will be added to your balance. Despite a theme that is hardly original, Coins of Egypt is an incredibly well-designed game that is not only aesthetically pleasing, but also very entertaining and exciting. Due to its relatively high return to player rate, small wins can made frequently, while features like the Pharaoh Coins Win Feature and the Free Spins Bonus Game can really fill up your treasure chest. Whether you are a tat tired of the ancient Egypt/ treasure-hunting theme or you can’t just get enough, this game is bound to excite you, as it has something for everyone.